Dishonoured is a game with an excellent pedigree. 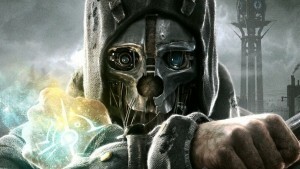 Bethesda Softworks have a well deserved reputation for producing classic games (seriously - these are the guys who produced Doom3, Oblivion and Skyrim to name but three). Dishonoured owes a lot - possibly too much - to other stealth assassin games - most obviously the Assassins Creed franchise. Fortunately in this game, much like Asssassins Creed II - they have no pretense of purpose other than sneak up on a mother-fucker and stab him in the back. What makes Dishonoured a great game is the points of difference. They expect you to take a variety of routes to acomplish your goal. This (to borrow from my day job) leads to two workstreams. One is action orientated (kill every one) the other is stealth. The stealth aspect is nice - it asks you to think about alternative routes to your goal - utilising high ledges, pipes and the airconditioning ducts. Yes, unlike Assassins Creed - Dishnoured is set in a different world. A place filled with hope and the joy of Earth Month - except for the plague. Dunwall is a city almost deserted. The only people you encounter are either city guards, thugs, and the occassional weeper - so called because they have the plague and they know they are going to die. It does have a wonderfully Steampunk vibe to it. With all the usual SP tropes - including whales. Whales are the source of all fuel and energy in the game. You can see ships with whale carcasses hanging from their butchering decks chugging up and down the harbour. This is the game that will make groups like Greenpeace, PETA and Project Jonah have a screaming apoplexy. You get to play the usual silent hero in FPS view. Corvo - the one time bodyguard of a slain Empress and now escaped prisoner - you fight the forces of corruption and evil - by doing things that are basically more corrupt and more evil. Fighting fire with fire is the motto du jour. Graphically the game is a pleasure to watch - the character models are well constructed and voiced. The Unreal engine that powers the game is in fine form. The design (apart from the lack of citizens) of the city is quite unique. The only quibble I have is that once you have explored one NPC's house (as part of a bonus mission) you will find exactly the same house layout in the next mission you do. I might have been in the same guys house twice - though, but for different reasons. Combat is very straight forward - you carry two weapons - or a sword and a gadget or magic spell. The weapons include a folding sword (always in your right hand) and a choice of pistol, crossbow, grenade, and magic spell. The magic is interesting - you have a variety of things and by far the most useful is the blink spell. It allows you to teleport a reasonable distance. Peraps to a ledge you can't otherwise reach, or from one spot of cover to another spot of cover across a well lit courtyard. Magic is cheap and mana is readily recovered. On normal mode enemies hit hard and react well to your presence if you are detected - or if they find a a corpse of a buddy. Not all attacks are lethal - you can sneak up and subdue people - or shoot them with sleeping darts from your crossbow. Their collegues will find them if you don't move the bodies however. Mistakes do happen - I have accidentally killed a civillian and shot a guard instead of subduing him. At the end of each mission you are rated on the amount of Chaos you have caused - currently I'm running at a High level. This means allies react differently, civillians (where ever they are) run away and I encounter more plague carrying rats and zombies than "normal." The game also warns that this will lead to "Darker outcomes" - Which I am curious to see. Overall - if you like a well written, deep story and original concept for a FPS game and are a big fan of Assasssins Creed - then you should own Dishonoured already. I'd give it 4 stars out of 5 as I'm finding the game engaging and interesting.